MyFacilityDude.com is the online portal that requesters use to access the work order request form. Bringing requesters on board saves time for the maintenance and operations department, streamlines the work flow process, and enhances communication. 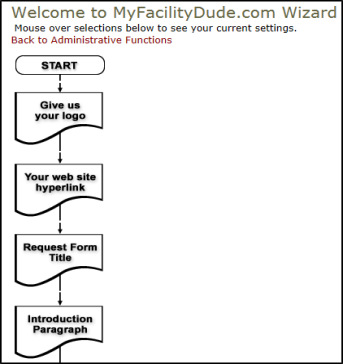 Hover over the Shortcuts menu and click on the MyFacilityDude Setup Wizard link. To begin the setup wizard, click the Start button in the flow chart. As you complete each step of the flow chart, click Next Step at the bottom of each page. This saves your selections and moves you to the next step in the process. Adding your Logo gives you a way to personalize the maintenance request page. If you have already added your logo in Work Order, it will automatically carry over to the MyFacilityDude page. Adding your organization's Website Hyperlink provides your requesters with an easy way to return to your organization's homepage from the MyFacilityDude page. Enter the Request Form Title to display at the top of the work order form. Select a predefined Introduction Paragraph or create your own to provide instructions for requesters to follow. It will be displayed under the Request Form Title. Creating a Contact List is a way to provide your users with a list of emergency contact names and numbers. You can select which user roles can view these emergencies contacts. If you would like your requesters to select a Budget Code on the request form, you can activate that entry field and also select if it is required or not. You can also select the DefaultBudget Code that will automatically populate on the request form. Select Budget Codes for Requester to choose from if necessary to change from the default. Decide whether or not to Show/Hide Assigned To & Equipment fields on the My Requests page. Assigned To will show the requester who has been assigned to their work order. One benefit to this is that the requester will be able to email the assigned person from their request page to give them additional information, if needed. Showing the Equipment field will allow the requester to select a piece of equipment needing repair on the work order form. Also in this step, Administrators will decide whether the requester's Phone Number and Area/Room Number are optional or required fields. If you would like your requesters to select a Purpose Code on the request form, you can activate that entry field and also select if it is required or not. You can also select the Default Purpose Code that will automatically populate on the request form. Select Purpose Codes for Requester to choose from if necessary to change from the default. This will be very beneficial if your organization uses purpose codes as part of the automatic routing. Decide whether or not you wish to Hide Requested Completion Date field on the request form. Select Craft Format for requesters. Administrators can choose between a Combo List (drop down list) or Icons. Select Locations for Requesters. Administrators can select which Locations will be available to Requesters and Managers on their new work order request forms. Under the Use in MFD column, put a check in the box next to every Location you want to make available to Requesters and Managers. *Note: If you remove a check mark from an already available Location, all associated Bldg./Units will also be removed. Click the Save button. *Note: You must save your selections on each page before viewing and making selections on the next page of Locations. Determine whether or not to Show/Hide Bldg./Unit drop down list. *Note: If you are not using Bldg./Unit codes in Work Order, it is recommended to hide this field. Select Bldg./Units for Requesters. Administrators can also select which Bldg./Units will be available to Requesters and Managers. Under the Use in MFD column, put a check in the box next to every Bldg./Unit you want to make available to Requesters and Managers. *Note: You will only be able to activate Bldg./Units that are associated with Locations that have been checked for use in MFD. Click the Save button. *Note: You must save your selections on each page before viewing and making selections on the next page of Bldg./Units. Choose whether the Time Available for Maintenance field will be provided for requesters and if so, will it be an optional or required field. Decide whether or not to Show/Hide Attachment option. Showing the Attachment step allows requesters to attach any kind of documentation, drawing, diagram, etc. to the work order. Select Priority Options you wish your Managers and Requesters to be able to select from. Select the default Priority that will automatically populate on the request form. View Sample allows you to preview the Work Order MyFacilityDude page that you have set up.